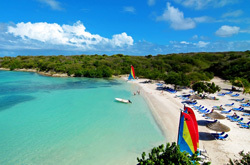 The Verandah Resort & Spa, located just 20 minutes from Antigua’s V.C. Bird International Airport (ANU), is a 30-acre, eco-luxury resort that opened in November 2007. Situated on Antigua’s northeast coastline and bordered by Devil’s Bridge National Park with its dramatic landmark rock arch, The Verandah Resort & Spa is an ideal vacation for family getaways or romantic escapes. For dining, all-inclusive or European plan options are available. Read More. The Verandah Resort & Spa has 180 villa-style suites that have vaulted ceilings and Caribbean décor with bamboo accents. Built as side-by-side, single-story duplexes, the resort’s suites offer the look and feel of a Caribbean villa while comfortably accommodating up to four guests with a king-sized bed and queen sleeper sofa. All suites come equipped with LCD satellite televisions, air conditioning, ceiling fans, in-room safes, direct-dial telephones, mini refrigerators, microwaves, coffeemakers, wet bars, irons and ironing boards. For larger families or groups, the resort offers Two Bedroom Villas, which can sleep up to 6 people. The Villas offer two bedrooms, one with a king-sized bed, the other with two twin beds, as well as a pull-out queen-sized sofa in the living room area and a full kitchen. Read More. Guests can sunbathe on the resort’s two white-sand beaches, play tennis, exercise in the fitness center or swim in any of the 3 pools. Other activities include aqua-aerobics, Caribbean cooking classes, nature walks, beach volleyball, soccer and cricket. Non-motorized water sports include windsurfing, Hobie Cat sailing, snorkeling, pedal boating, stand-up paddle boarding and kayaking, which are ideal activities in the resort’s calm bay waters. A tropical 18-hole mini-golf course, set amidst waterfalls, ponds and local landscaping, is a real treat for all guests. Read More. The Verandah Resort & Spa features four restaurants and a beach grill. Seabreeze, the resort’s main restaurant, serves breakfast, lunch and dinner buffet-style. 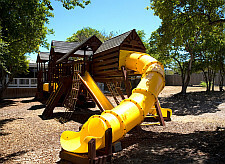 It offers a wide range of choices that are sure to please guests of all ages. Nicole’s, a fine dining restaurant, offers a blend of elegantly presented, modern European cuisine. Warm, red walls and dark wood trim create a cozy ambiance, and rattan, bamboo and upholstered furnishings create a welcoming, Caribbean feel. For a $40 surcharge, guests can celebrate a special occasion or have a romantic private dinner. The Buccaneer, an a la carte restaurant, serves Caribbean-inspired, family-friendly fare. The Beach Bar & Grill, overlooking the main water sports beach, is open for lunch and dinner and serves casual grilled fare & snacks such as burgers, sandwiches, salads and self-serve nachos. The new Wadadli Snack Shack is a grill right on Rasta Beach serving up tasty snacks all day long. Afternoon tea is also served by the main pool bar daily from 3:30 to 4:30 pm. The Tranquility Body & Soul Spa offers eco-conscious, restorative treatments for the body and skin, using locally sourced ingredients. Treatment examples include a Thai Yoga massage, a Sabai Stone treatment, a caviar and pearl anti-aging facial and a green coffee wrap designed to reduce cellulite and water retention. 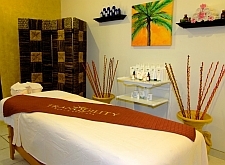 Tranquility Spa uses Pevonia Botanica products. A full-service salon offering hair and nail treatments is also available. Read More. If you require any booking assistance, including air-inclusive packages, please visit our website here or call +1(954) 333-8570.